Welcome to Triss Shopify theme from Buddhathemes. 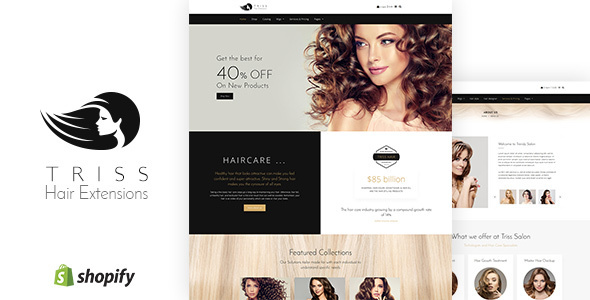 Triss Shopify theme is built with Shopify arguably the finest e-commerce platform for launching your online sales of Wigs of both natural hair and artificial hair, different styles of hairdos, Shampoo, Conditioners, Dry Shampoo, Hairspray, Oil And Serum, Root Touch-Up and other hair spa therapies. In addition, for your requirements of different styles of wigs of both human hair and synthetic hair, straight hair, wig repair, restyling, cleaning and alterations and/or other accessories. Furthermore, Triss Shopify theme is an exclusive e-commerce theme for your shop. Therefore launch your hairstyling theme stores in style with Triss Shopify. For all your requirements of online sales platform for your premium wig services and Trichology based centers. Triss Shopify is the theme of choice, for all your needs of wigs and hair care. Build your website with flair using Triss Shopify. Showcase your services and products in style with Triss Shopify. Having developed more than 50+ themes in Shopify platform, we offer our latest Triss Shopify e-commerce theme with intuitive features needed for successfully running your online store. Triss Shopify accessories come with wonderful technologies such as Sass CSS, Owl Carousel, Front Awesome and Animation. Besides, Triss theme offers Flex Slider, Product Carousel, Blog Carousel and Ajax Add to Cart functions. This Ajax add to cart feature is really unique not offered in many other themes. It has been designed and developed to display beautifully across all of today’s modern devices including laptops, tablets, smartphones, and of course desktop computers. Shopping cart is the most important aspect of any e-commerce website selling goods and services. Nevertheless, the success rate of the online store is directly proportional to the speed of adding and checking the items in the shopping cart. The ease of the whole buying process is enhanced by Ajax based Shopping Cart. Buying in Triss Shopify is effortless and quick because of Ajax add to cart functionality! Triss Shopify theme offers you the Color Swatch option with the ability to change the color display on your products just by selecting the color. These color changes on the products give more options to the buyer while he is checking. The user selection of colors would display the products in variant colors. Items coming in different color options such as black and brown watch straps, dials in variant colors could well use this feature to showcase more choice to your customers. Therefore, go for Triss Shopify theme ably supported by the legendary support team of Buddhathemes.